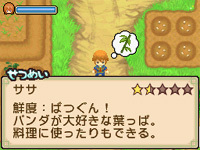 When you select an item in Harvest Moon: A Tale of Two Towns you will see its description, star rank, and freshness (if applicable). The overall quality of the item will determine how much profit you can earn if you ship the item. For edible items, it also influences the stamina recovery gained when the item is eaten. Star rank and freshness is also important for the dishes you enter into the cooking festival. You won't want to enter a rotten dish! Not every item has a star rank and freshness. Your tools and fished-up garbage won't have these qualities. Most items in the game have a freshness rank. When you first obtain an item, it is at its maximum freshness. Freshness is on a 100-point scale. The more days you store the item, the less freshness it will have. It is best to sell an item when it is at its highest freshness. Freshness is a factor for items that are edible. Every morning the game will calculate the freshness of the item based on the season you are in, the number of freshness points the item currently has, the type of item it is, and the location of where the item is being stored. The calculation will take the current point value of the item and factor in the other influences to calculate a new freshness point value. If the resulting point value drops to 0 or less than the item is rotten. The season you are in can impact the decay rates of your items. During the Spring and Fall when the weather is mild, the items will decay slower than if you were in the heat of Summer. Winter season is so cold that items will lose freshness slower than any other season. Some types of items will decay faster than other types. Milk goes bad the fastest, followed by fish, crops, and other types of items. The location where you store your items will also determine how fast the freshness points will drop. Storing an item in your rucksack will cause the item to decay the fastest. The other option is to use your horse cart. The decay rate of the cart is less than your rucksack and the style of cart you have will influence how quickly the item rots. If you picked up a Lavender on the mountain during Fall and store it in your rucksack until morning, then 100 points - (2 + 5 - 0) = 93 points of freshness the next morning. This means after 5 days, the Lavender will have dropped from Super Fresh to Fairly Fresh. If you had stored it in a Sleigh Horse Cart instead of your rucksack (- 0 becomes - 4), then it will take 10 days to drop one level of freshness. There are horse carts that have infinite freshness. The UFO Horse Cart and Mechanical Horse Cart can keep items fresh indefinitely! The UFO Horse Cart comes from completing one of Oracle's request and the Mechanical Horse Cart can be purchased from an animal shop for 300,000 G once you reach year 3. Besides freshness on edible items, the star rank will be a factor in calculating the profit you earn when shipping the item. The stars are on a scale of a half star; .5 star, 1 star, 1.5 star, etc. The highest star rank you can have is 5. Determining how many stars appears on an item is based on the item's Star Points. Each half star on an item will be a max of 30 Star Points. Zero stars means the item has 0 SP, .5 stars means the item has between 1 and 30 SP, 1 star is at 31 to 60 SP, and so on. An item will have 5 stars once it reaches 271 SP and there is a maximum of 300 SP. Animal Products: Based on the hearts of your animals. More hearts means higher star rank produced items. You can increase your animals' hearts by letting them outside, talking to them, and feeding them every day. Crops: You can buy fertilizer from Gombe's seed shop in Konohana. The fertilizer takes one square of soil on your crop field and will affect all crops surrounding its fertile spot. Once you pick a higher star rank item, and you have the seed maker, you can convert the crop back to seed and re-grow with fertilizer to increase the rank again. A stick of fertilizer will add 1 SP to the growing crop each day. Fish: There are two ways to handle fish. Caught fish star rank are based on your fishing level which increases as you catch different types of fish. For fish you are raising in your pond on Konohana, your fish will increase star rank as they age in your pond. You won't get 3 star rank fish or later until year 4. Honey: You "seed" your bee hives by getting wild Honeycombs from the mountain. The higher the star rank of the wild Honeycomb, the higher your resulting honey. Wild Items: The star rank of the wild items like flowers, mushrooms, honeycombs, etc. will increase automatically as you proceed through the years. In year one you'll find items worth 1.5 stars maximum. In year two they increase to 2 stars, year three is 3 stars, year four is 3.5 stars, and year five through nine will get you wild items worth 4.5 stars. Once you reach year 10 you can start to find wild items worth 5 stars. The point value that each half-star represents will help you with winning the seasonal Crop Festivals if you live in Konohana Town. The individual points do not affect how much the crop ships for; shipping profits are based on how many stars the crop has, not how many Star Points each star represents.